The starting point of all great e-learning courses is establishing a good foundation. A crucial part of that foundation is to storyboard the entire course. Storyboarding is a step in the process that too many people ignore, however, wrongly thinking it is not necessary or may delay production. I take a very different view. Storyboarding has a long history of success in a range of fields, including creating e-learning courses. The use of storyboards originated in the early days of film production, with Disney being among the first to use them. That was back in the 1930s. 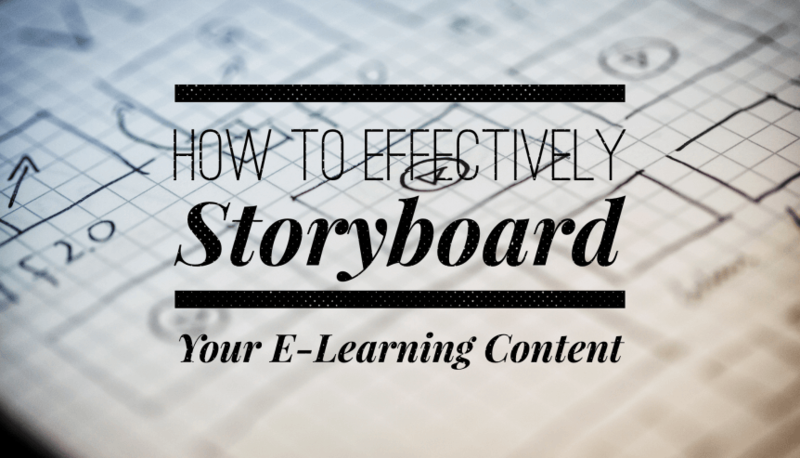 What about using storyboards in e-learning? Storyboards bring a range of benefits. Makes the design and development process more effective and efficient. Saves time overall as storyboards help you spot problems with the course early, before you create the content. Helps optimise the learning experience. Makes e-learning courses more engaging. Ensures the design of the course suits the target audience. Ensures all required content is included. Helps in the future when you want to update the course with new content or to localise it in another language. With storyboards, the process of doing this is quicker plus it is easier for a new developer to pick up where the original developer left off. Many storyboards you create will be reusable. This means you can use the storyboard as a template too, for example, create a fact sheet, a quick reference guide, or a survey. Storyboards are visual although they should have enough information to make it easy to understand what they are about. You don’t need any detail, but there should be enough content to make them usable by someone not in the development team but who is able to give you feedback. In addition, it must be easy to change the order of your storyboards at any stage of the process and the design should be simple. You don’t need a perfect sketch or finalised text. Use the following tips to ensure you use storyboards effectively in the creation of your e-learning course. Understand your objectives – you should do this before anything else. Make sure you define the learning outcomes and what you want the learner to achieve. Understand the audience – this may sound straightforward if the course is for your own staff, but it is still important. For example, do all the learners have similar job roles, skills, and experience or are the audience broader? Understanding this will help you develop the direction of the course. Create the storyboards – once you define the objectives, learning outcomes, and audience, you can start creating the storyboards. Programs like Microsoft Word or PowerPoint can help you do this. Group content sections under working headings – it can be helpful to visualise and structure the course by giving titles to groups of information. You can remove these as you start creating the final version, but they will help you get the ordering right. Include all course elements – this includes transitions between sections, assessments (don’t leave them until the end), and navigational options, particularly if learners can take different paths through the course. Review and improve – once you have the storyboards, review the flow of information. Does it deliver an engaging learner experience? Will the learner achieve the outcomes you outlined in the first point above? Are there any improvements you can make? For example, are there too many videos together that you could space out, or are there long sections of text without any multimedia or interactive content? Get feedback from others – to check your ideas, structure, design, and approach. Determine the content – from the storyboards, outline the content you will need. Double check the volume of content to ensure you don’t have too much or too little. Make sure there is enough variety and check for and remove unnecessary repetition. You should also remove superfluous or redundant content. In addition, you should identify any content that is missing. As you can see, the process of creating storyboards progresses the development of the e-learning course significantly. Storyboarding not only produces a better result – it gets you to that result faster.